The Songkran Festival, informally called "Thailand water festival" is one of the grandest and most important events marking the start of the Thai New Year. It is the largest celebration in Thailand. It takes place in mid-April every year. During this period, the whole nation becomes crazy and you will enjoy local entertainments full of fun. Cheers roar through the air as the packed crowds hurl water at one another. People pour buckets of water over each other, and some of them aim hoses at the crowds and some fire giant fluorescent water guns at each other. Just because of its particular and exciting way of celebration, Songkran Festival is getting more and more popular all world round, so more than half a million tourists from all over the globe join the water fights and indulge in local entrainments. The festival takes place in April and welcomes all locals and tourists alike, with open arms. Songkran is derived from a Sanskrit word literally translated to "astrological passage" and may be interpreted as "move or change in position of the Sun". So Songkran Festival is the symbolic start of Thai new year and it is also the starting of the rainy season as well. People look forward to the new year that can bring happiness and blessings in their lives and famers wait for the rains to begin in order to plant their rice. Rice is a traditional and major crop being cultivated in Thailand which requires a lot of water amount for its production, so water is the most important thing that can merits its own in the celebrations of event. Songkran is the occasion for family re-unions, annual house cleaning and temple visi ts. The festival always lasts 3-7 days and officially starts on April 13. The first day of it officially called National Elderly Day, traditionally, on this day, Thais perform the Rod Nam Dum Hua ritual. During the ritual, young generation would pour fragrant water into the elder's palms to show their humility and beg the elder's blessings. In the temples, people also pour water on senior Buddhist monks. After that, the chief monk will give a sermon and bless those who attend this bathing ritual. 'Bathing the Buddha image' is a very important religious ritual. The devout Buddhists pour fragrant water over Buddha statues both at temple and at home. The second day of Songkran is the National Family Day. On this day, family members would rise early and give alms to the Buddhist monks and spend the rest day together. Before the year of 1940, Songkran was based on the lunar calendar, and the dates of the festival are not fixed. Since Thailand adopted the international New Year's Day in 1940, the festival officially runs for three days starting on April 13 and ending on April 15 every year. However, many locals take off from work and stretch the festival into as long as a week, especially in tourist places like Pattaya. Songkran 2019 will last from 13 Apr to 15 Apr (from Saturday to Tuesday). It will once again be the biggest water fight in the world. Are you ready for battle in 2019? We're waiting for you! This is an ultimate guide telling where to party in Songkran Festival in details in all the main areas of Thailand. Songkran is a festival for family reunions, so during the festival, half of residents in capital city of Bangkok will leave the city for their hometown for family reunion. In Bangkok are tourists, who fly into the city particularly to party in the most exciting and colorful festival. During the festival (April13 to 15), people take off from their work and most office buildings, banks and even family-run shops and restaurants shut down, but the big shopping malls usually remain open. -Silom Road: The entire road would be closed off to traffic during the festival. It is the largest and wildest crowd in Bangkok. You will find the 5 km street is packed on two levels with thousands of young people carrying anything that can spray water. - Khao San Road: the gathering place of backpacking from all over the world. During the festival, the entire length of Khao San Road becomes a water fight battlefield and you are going to get absolutely wet from head to toe. 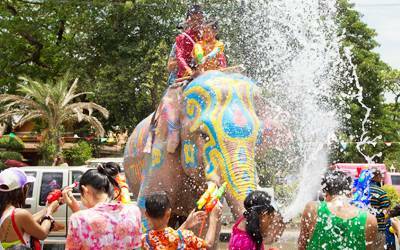 Celebrating Songkran in Chiang Mai can lead you to a new level of enjoyment. You can have the most fun there. You may find the longest and biggest parties in Bangkok, but you can find the best water fight in Chiang Mai, which makes the Chiang Mai one of the most popular places in Southeast Asia. Visiting Chiang Mai in the middle of April can bring a hell of fun. Commonly, Songkran is being celebrated throughout the city in Chiang Mai. People there have their water guns and buckets ready at every corner. Go ahead to Tha Pae Gate in the Old City, then you will enjoy a full 4km of water fighting along the old moat. Street stalls sell all you may need for the water fight. There are parties taking places along the moat with more cheer and local experience available. The celebrations of Songkran that you can enjoy in Phuket are of an international level and can be the most energetic among all of the other places. You can find tourists, locals and expats together enjoying the water fight by throwing water on each other through water guns, water cans and water buckets. Undoubtedly, Patong Beach is the noisiest place during Songkran, you will find the most bars and the best nightlife and you can also find huge water fights here. There is also a parade, a Miss Songkran beauty pageant. As we all know, Pattaya is a party city so the Songkran festival lasts longer there than anywhere else in Thailand. The water fights start on April 13 and it would last for a week. If you arrive in Thailand a little bit late, Pattaya is your last chance to party. During the festival, the whole city turns into a crazy water fighting battlefield. You will definitely get wet at the moment you go out. Unsurprisingly, Beach Road is the most famous place to party. The road is closed to traffic and the stages are set up here for live music and foam machines. The fire department park their engines here with numbers of water butts fulfilled water for the revelers to reload their "weapons". The roads that allow vehicles become a slow-moving traffic jam. The pickup trucks with their radios on full volume on the road become moving parties, with their own water buckets. But the biggest celebration of this water festival in Pattaya comes on the 19th of April and is popularly known as the "Wan Lai". It is the biggest water party that Pattaya ever sees. It is followed by the 'Kong Khao' parade which takes place in the sunlight and is a march as a symbol of appreciation for the Goddess of Rice. Further lots of fun contests are held such as beauty pageants. Post the parade several cultural shows take place which gives an insight into Thailand's rich cultural history. Beautiful sculptures and sand castles are also made by the locals alongside the Bang Saen beach. 1. Don't splash water after sunset. Some people will do that especial the tourists from aboard, but that is not right. Don't get mad, angary or feel lonely when Thais and tourists are splashing water on you. They want to share their joy with you and giving new year blessing to you. The wet mayhem is a part of the Songkran celebration, just accept it. If you decide to take part in, you will definitely get wet – very wet! Barricade yourself in inside the hotel room and don’t go out in daytime. No matter how much you are begging and no matter what items you are carrying with you, you would be splashed by the hotel staff as soon as you step out your room. Make accommodation and transportation reservation as early as possible for Songkran period in Chiang Mai, Phuket, Pattaya or Koh Samui otherwise you have to postpone your trip to next year. Don't go out barefooted. Although the government does efforts to ban bottles, broken glass are everywhere. 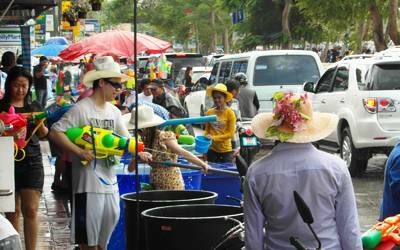 Get bucket – there are many around for free or purchase a water gun or cannon in the market before join in the fun. Tie a string onto your bucket so that you can reload your bucket quickly from water barrels. Drunken revelry is a big part of the festival. There are always lots of people dancing and drinking in the streets. The Chiang Mai government has stopped numerous drunken behavior in public. Be careful, you could be fined. Drunk driving is a serious problem during the Thailand water festival. Be careful when across the street. Be sure to keep in mind do not drive when you have been drinking. Do not "fire" or pour water on motorcyclists, to prevent road accident. Sunglasses will protect your eyes from water and other mysterious paste. Do not wear white because it goes see-through when wet! Do not wear expensive clothing, it will be destroyed. Do use a waterproof pouch to protect your mobile phone and other valuables. Use four-wheeled public transport if you are heading to one of Songkran 'hotspots' as the traffic is snail slow. The water splashing is fun for everybody, but do remember that Songkran is a religious festival. Keep out of the way of worshipers at temples and shrine and show your respect when visiting temples. During Thai New Year, when people are splashing water, how do they greet each other? The traditional way to wish someone well and to make peace after pouring water on them is with sah-wah-dee pee mai means "Happy New Year." More than that, you can say "Happy Songkran Day" pronounce in Thai as "suke sahn wahn song kran". It seems that there is no way you can get away from getting wet and we can say you can't! Unless you hide in your room in the hotel for three days or you can go to some rural places where water is sprinkled than crazily pouring. However, because there are lesser foreigners in those place you are easily to be taken as a priority target. Constantly, you might have some chilled water with ice poured over your head. It is really test one's patience after the second or third day, so forget to sit, read or work in any open air environment. 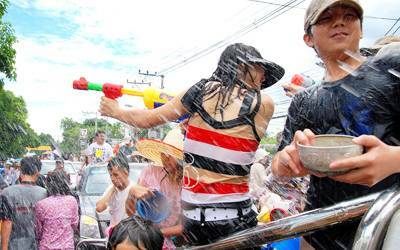 Ultimately, the easiest way to avoid getting wet: don't go anywhere near Songkran. 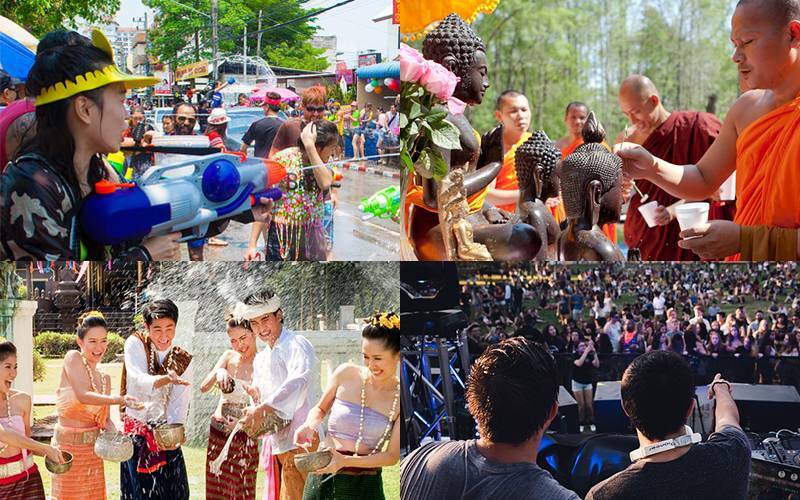 Songkran Music Festival is an "unlimited-fun event". This three-day event takes place from the 13th of April to the 15th in Bangkok. It is, no doubt, the biggest celebration of the Songkran festival. It takes the party to the next level. In this hip and happening music festival, top class DJs from all around the world come and do a concert. 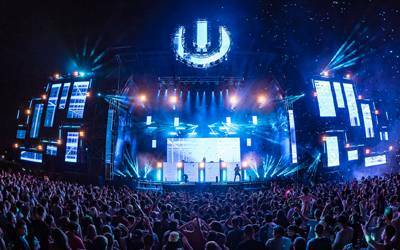 Some of the popular international DJs that were present were DJ Snake, Mashd N Kutcher, Sick Individuals, Oliver Heldens, Krewella, and Ummet Ozcan. TUJAMO and OOKAY are also added to this list. It is popularly known amongst the locals as S2O, where the S stands for Songkran and 2O stands for 2O from H2O, symbolizing fun and water play. The recent S2O Songkran Music Festival 2018 was held in Park Rama IX. Bangkok 2018 was conducted at an area spanning 6,000 square feet. The park had a big stage around 70 meters long. It featured a 360-degree water technique that was showering every inch of the venue and soaking the people, making it a fun event. EDM, House and Bounce music beats were played all through the day into the nights. Fireworks added to the fun and beauty in the night. The music festival was spiced up with excellent local Thailand food entrees from popular Thai restaurants. The S2O Songkran Music Festival is so popular that it has been completely sold out for three years in a row now. Owing to its popularity, if you plan on being a part of this event you will have to book your tickets well in advance. UME Travel would be pleased to book the tickets for you. Majority of the people reading this post love to travel. Well, traveling to Thailand in April is the best option for those looking forward to spending quality vacations with their friends, family, and colleagues – all appreciation goes to the amazing Songkran Festival. Make sure to book in advance so you do not miss out on a fun traditional holiday. Contact us and we can help you to have a Tailor-made Thailand experience that includes the best of the Songkran Festival.